Applied Fiber will custom build cable assemblies for your application. We will build to your cable, connector and length specifications from our large stock of components in inventory. If we don't stock your required components, we will purchase them and build the product for you. 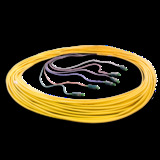 Applied Fiber has vendor relationships with most cable and connector manufacturers.